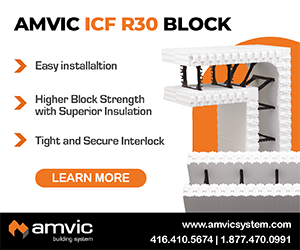 The leading brands ICF products have been designed to work easily with structural steel. 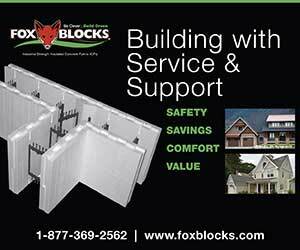 Built-in horizontal reinforcing holders locate steel with precision and eliminate tying. Simple methods for inserting vertical steel have also been developed. 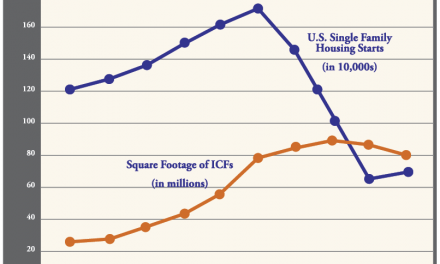 Together, these developments have dramatically cut reinforcing steel placement times when compared to older ICF models that require steel to be tied in place. 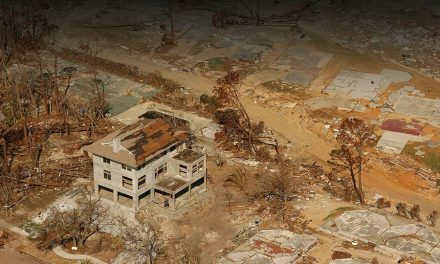 But even with these great advancements in our industry, rarely do we see folks on ICF project sites jumping to be the “rebar man.” Setting forms still remains the task of choice. But if your installation crew has one of the rebar cutters and benders on the market, the rebar man’s job could be significantly easier. Although it depends on the region and specific reinforcing requirements, most “simple” residential projects don’t require much thought as to whether it’s better to order pre-shaped reinforcing or to order straight steel and fabricate bends on site. In most light residential projects, the volume of reinforcing needed doesn’t warrant prefabricated bar. 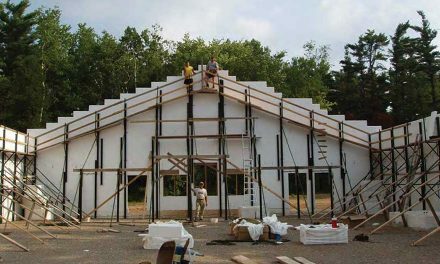 One drawback to ordering prefabricated steel for ICF wall construction is the need to have space to sort bar, not have it in the way of the immediate work area, and yet be close to where it will be placed. Steel seems to always get in the way when staging forms, bracing and window bucks. Prefabricated bar costs more per pound, but may be worth it on larger jobs. Make sure to stage steel where it won’t be in the way of the form setters. Another drawback to prefabricated bar is that it costs more per pound than standard length bar and should there be changes or errors on the site, the bar still requires alteration. 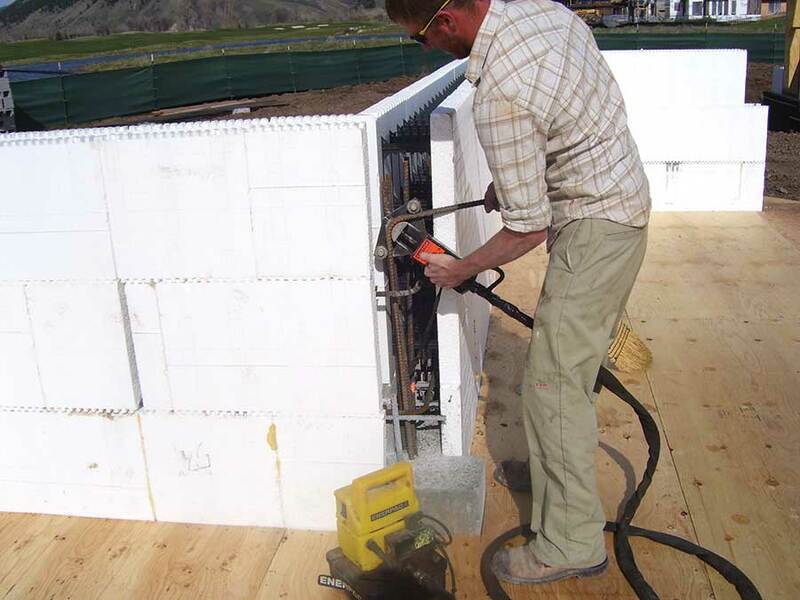 When ICF is being used on larger projects with substantial reinforcing requirements, the option of ordering pre-made corner bars and pre-cut vertical steel may make sense and eliminate some jobsite time and labor. When making the decision on how to deal with reinforcing steel on ICF projects, the final determination always comes down to cost, supply of labor and time allotted on the jobsite. In most cases, bar is fabricated on site with the use of rebar cutters, saws and benders. For the installers that utilize “manual benders mounted to a board” (also known as the “cordless rebar cutter/bender that operates not on batteries but on brute strength”), beware that most of these units do not bend bar in conformance with nationally adopted building codes. 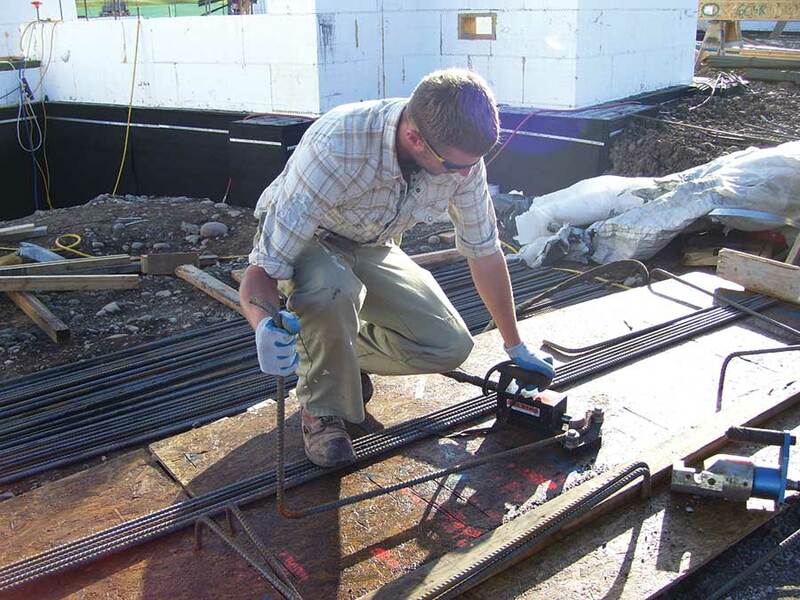 Jobsite fabrication of rebar is often faster, safer, and more accurate if the crew has access to a portable rebar cutter/bender. ACI Chapter 7, part of most local codes, specifies that the minimum radius of bends on reinforcing bar #3 (3/8”) through #8 (1”) must be no tighter than 6 times the bar diameter; 6 db= six times the nominal diameter of bar. It should be noted that many of the portable and handheld benders don’t meet this minimum code either. In addition to manual benders, a range of pneumatic, hydraulic, and electrical rebar cutter benders are on the market. Fascut, EZE Bend, Toshiba, HIT, and Benner Nauman are all popular brands. There are many factors to consider when looking at the purchase of a portable handheld rebar bender or cutter. First and foremost is the elimination of the safety hazards associated with field bending with a pipe or “hickey bender” or a back-straining manual bender. A second factor is the fact that bending bar is a brutal task; when a tool is put into a worker’s hands to bend bar, you cannot expect them to return the tool to you in the same condition as it was earlier. Obviously quality, durability and “idiot-proof” are key factors. A good handheld bender will work even when close to beams, forms, and cast-in-place bar emerging from the concrete. Thirdly, the tool must be adequate for the tasks that you intend to use it for. It must have features and benefits that will provide a substantial return on investment before it becomes a boat anchor. 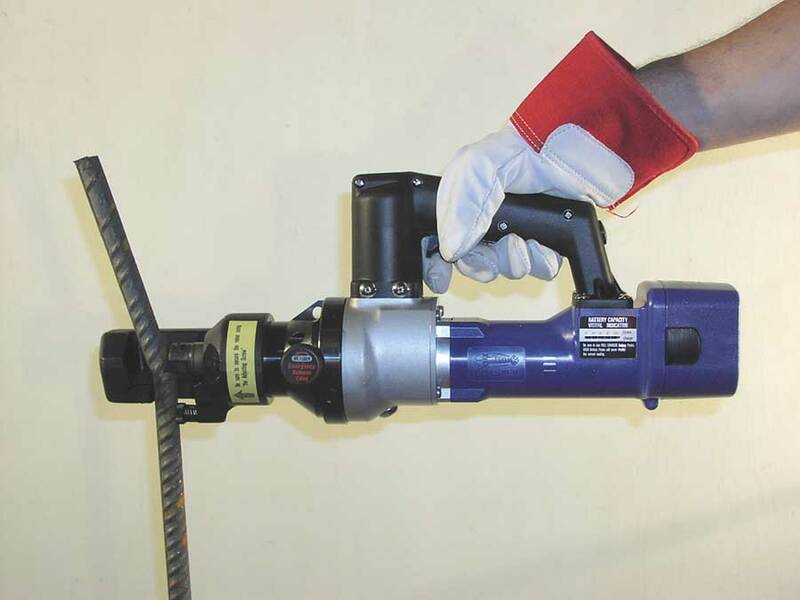 Why invest in a rebar cutter and bending tool? Because men always buy tools! First, tools save money. Many installers don’t see the savings if they eliminate a day’s work in the field, they only look at the number of days worked. Today’s marketplace demands that if the company is to stay in business, then the company must operate with innovative methods to produce more and make a profit. With the ever-increasing cost of reinforcing steel, installers can eliminate corner bar lap splices by field-bending bar to fit precisely. By bending bar around corners, instead of splicing in a pre-bent corner, workers can easily eliminate 50% of the overlap splices on a project. The savings in material and the added quality of the work adds up to an overall savings that will help pay for the tool. 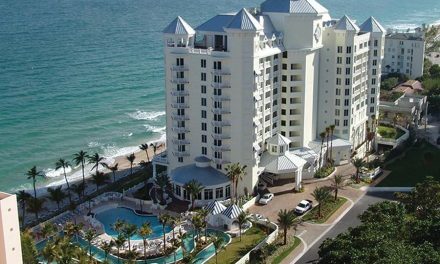 To determine if you can justify the cost of a tool, simply calculate the cost of the reinforcing steel and all the lap splices and corner splices that could be saved on each project. Most will find that a typical rebar cutter/bender will pay for itself after a few projects. Also, reduction of waste bar not only saves money on the front end, but also eliminates the cost of hauling off heavy bar to the landfill. The labor spent cutting and bending bar onsite may be less than the time and labor spent sorting and moving prefabricated bar, since this is typically dumped as far from the needed location as possible. Remember, fabricated bar costs more per pound than straight bar. Simplify and create safer work environments by casting bar straight and bending later. Instead of dealing with a rat’s nest of bent rebar protruding from the wall on pour day, angle bars can be set in the top of walls straight. After the roof deck is set, you come back and bend the bars with complete accuvracy. The beauty of a lightweight handheld bender or cutter is that it allows this to happen without the stress, strain and pain of working around rigid cast bar. 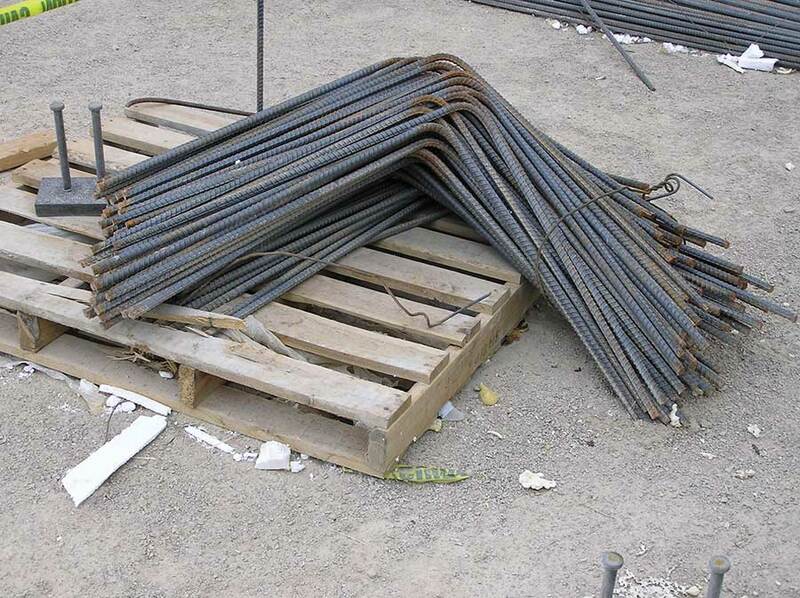 Corrections to irregular bent bars by other careless trades are completed quickly and easily. Handheld electric cutters don’t throw off sparks that can burn into ICF or cause fires. Finally, workers are less apt to be injured if bar unexpectedly breaks while bending which is common with hickey type benders. There are many tools available on the market. A few are made in the USA; many more are made overseas. When it comes to price and quality, you get what you pay for. A trip to World of Concrete is the best way to do the research on portable cutters and benders. World of Concrete is the only venue in the U.S. with all the tool manufacturers represented in a few rooms. 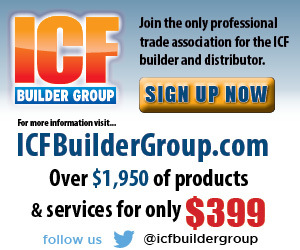 In order to value the cost of a tool, one must be willing to reach out, run it, try it and understand how it will work with the ICF form they are using. This is easily completed at World of Concrete in Las Vegas …as well as see everything else the concrete industry has to share. Weight—The tool must fit within the long term comfort zone for most workers. A hand-operated tool will not be utilized as a truly “portable tool” if it is too heavy and cumbersome to the worker. The concept of moving the tool around the jobsite applies only to the lightest of the tools on the market. This is why most of the cutters and benders on the market are demonstrated and advertised “sitting on the ground” rather than held in the air. Many of the ‘hand-held” units are heavy enough to require two hands to hold it steady. This eliminates the ability to hold the bar that is being cut in place. Some have bulky trigger assemblies that, combined with the weight of the tool, make it hard to squeeze. Look for a lightweight system. Finally, a good cutter/bender should be well-balanced. If the tool requires two hands to hold steady, then placing a bar in the tool is nearly impossible. Safety—Anyone that has trimmed short stubs of bar off of a longer piece with an automatic cutter will know that the small piece of bar can quickly become a piece of shrapnel in someone’s eye when it snaps off. Surprisingly, very few rebar cutters have provisions to avoid this. The EZE Bend cutter is the only unit I know of with a built-in shock absorber that virtually eliminates flying rebar. Find out where the automatic shut-off is located. Will the machine stop and reset instantly, or does the machine need to run full cycle before resetting? This is not only a nice touch and great for making last second adjustments, but if your glove is pulling your thumb into the operating area, it’s great to be able to immediately stop and reverse the operation of the tool. Durability—Jobsite tools are subject to jobsite conditions and rebar cutter benders are no different. The tool must be virtually unaffected by mud! Also, make sure the tool you choose has the ability to operate in the rain. Many tools have open electric motors. A better choice would be to get one with a separate power unit, where it can be kept out of the rain. Versatility—A good cutting/bending tool is adaptable. The ability to rotate handles or power heads is a necessity especially if there is repetitive work. The tool should be easily adjusted to conform to the work requirements, not the user. Be sure the bending component will satisfy ACI chapter 7 Minimum Bend Radius requirements. Also check the ability of the tool to bend in close quarters such as within beams, and close to forms. With the growing popularity of concrete floors and decks, be sure that the machine you choose will bend cast-in-place bar close to the concrete. Maintenance—What are the maintenance and consumable parts of the tool? Some tools have many moving parts and require replacement parts often. Others are virtually maintenance free. On the cutters, how often do cutting edges need to be replaced and at what cost? Will you have replacements on hand constantly, or will downtime eat profits? Are cutting heads easily adjusted for different bar diameters without wrenches or tools? How do you get warranty work or service? These are questions that need to be answered before committing to a purchase. In many cases, the lower price tools are the most expensive. For a professional contractor, the only way to make a profit is to have tools that make the job better and faster with guaranteed reliability. If the tools are not quality and fail to operate on demand, then quality and time on the job suffer. FasCut’s “Lobster” weighs just 14 pounds, but can cut up to #5 grade 60 rebar. 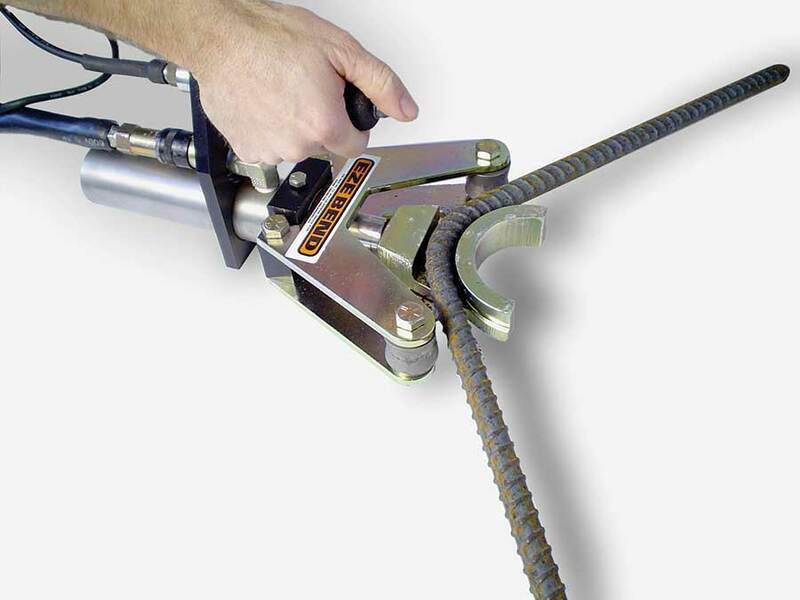 It not only gets into confined locations, but eliminates dragging around cords or hoses. 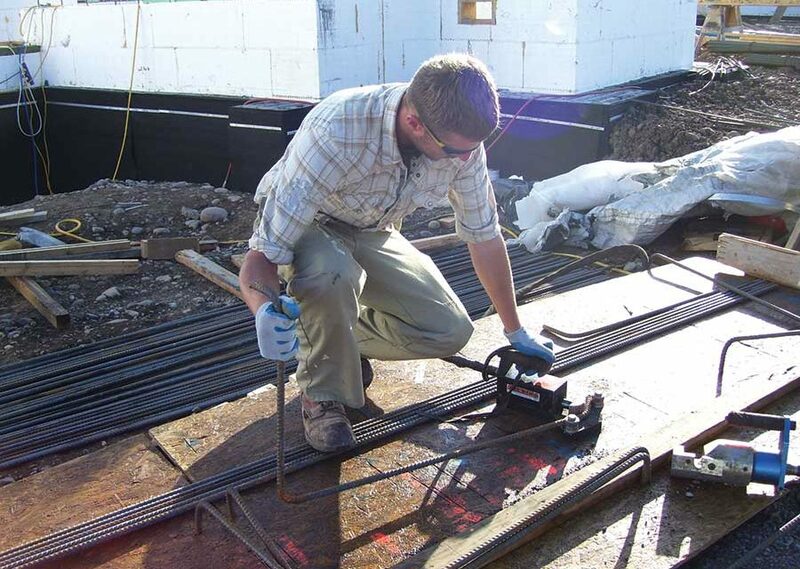 This jobsite rebar fabricator weighs 180 pounds and runs off a standard 110-volt outlet. 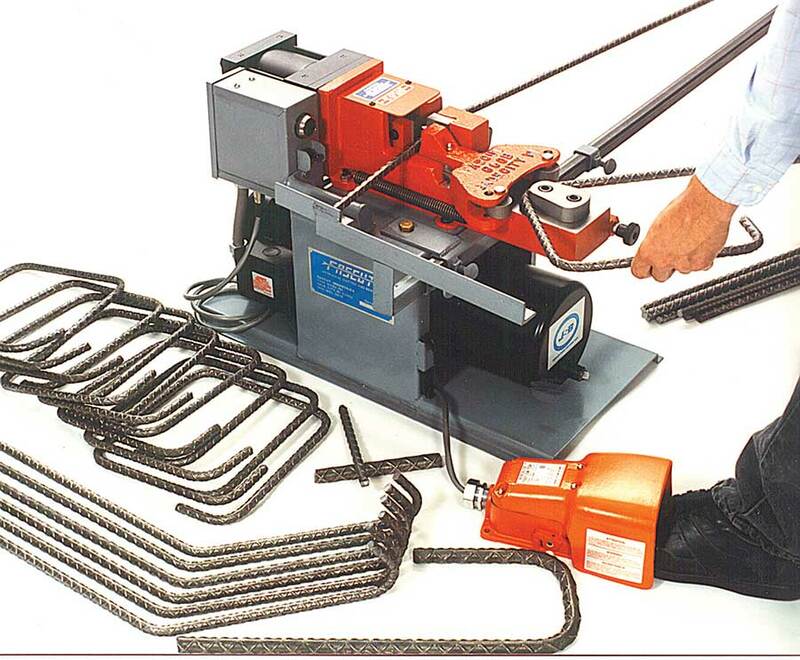 Cuts and bends in up to #6 rebar can be made in seconds without changing heads. EZE Bend’s #6 Pull Bender runs off a simple 20-volt wire. Weighing just 9 lbs., it can handle up to ¾” rebar, can access tight spaces, and makes bends in accordance with ACI standards.